Rep. Brad Roae (R-Crawford) on Tuesday presented information about his tax-free transportation funding proposal to the House Finance Committee, which held a hearing about his plan. 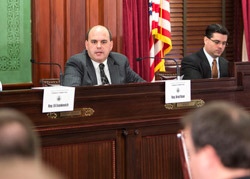 HARRISBURG – The state House Finance Committee today held a hearing to gather information about a bill introduced by Rep. Brad Roae (R-Crawford) that would help Pennsylvania fix its failing roads and bridges without creating any new taxes or raising any existing taxes. Roae’s House Bill 1630 would provide $6.6 billion for road and bridge repairs in its first decade by relying on sales tax revenue collected on vehicle purchases in the Commonwealth. The Commonwealth currently collects approximately $1.2 billion in sales tax revenue based on vehicle sales in Pennsylvania. In 2015-16, the amount would be increased to 20 percent, or $240 million. The amount would continue to increase by 10 percent each year until, in the 2023-24 fiscal year, 100 percent of the sales tax revenue generated from vehicle sales would be used to fund road and bridge repairs. The conservative-leaning Commonwealth Foundation and the liberal-leaning Pennsylvania Budget and Policy Center both provided testimony at today’s hearing. A testifier from the Pennsylvania Automobile Association informed the committee the organization is neutral on Roae’s legislation. Roae’s bill must be considered and approved by the House Finance Committee before it can be voted on by the full state House of Representatives. Copies of Roae’s testimony from today’s hearing as well as a series of informational charts he provided are available on his website at www.RepRoae.com by visiting the “press releases” section under the “news/photos/videos” link on the left-hand side and finding this news release.